Hey guys! So I’ve recently changed up my tanning routine-not because of anything wrong with the previous, but just because it’s hard for me to get out and spray as often as I like! So I found an easier way to stay dark! They’re called “Isle of Paradise Tanning Drops.” AND guys. They are amazing!! I’ve never been so pleased with a tanning product that I self apply! I use the dark! I recommend purchasing them from Sephora- They let me try the medium and said if I wanted darker to come back and exchange it so I did. I’ll walk you through how I use them. So obviously I wash my face everyday- and that’s where my tan fades the quickest. I just add the drops to my facial lotion. It works with any lotion!! I started with 2 drops + my face lotion - you’re not putting a lot of lotion on your face- then rub your hands together and apply to your face! I have decently sensitive skin and they didn't break me out at all! For my legs and arms - cause let's be honest I am being super lazy and only tanning the parts that show 😂- I just use the Jergens Shea lotion but you really can use any! I have tried different ones however DO NOT use Bath and Body Works with it. They have A TON of alcohol in them and it will make you streaky! It works best if you work in small areas. I do one shin with one pump of lotion and 3 drops. Then I do the other shin each thigh one at time. I do the same with my arms! It's all about what looks best with you! You can also play when the drops and go darker and lighter if you like! It looks like a tiny bottle but I have used it about every day since early December ( so a little over a month) and I still have half a bottle! If you spray tan read the section below for info on that :) Feel free to message me with any questions or comment on this post- and let me know if you tried them! This post is all about what I use to tan/stay tan. Throughout college, I actually worked at a Sun Tan City in my hometown. I had never had a spray tan before and one of my co-workers convinced me to try it. I immediately fell in love. It was so much easier than laying in a tanning bed (& way better for your skin). I always hated how itchy and dry my skin got from laying in the tanning bed. When I got pregnant I couldn't lay in the tanning bed anyways so I sprayed to keep up my tan! It's a machine that sprays you so no awkward standing there while someone sprays you down. I usually do the dark tinted. They have two types of solutions there and I think the tinted looks more brown toned than the clear which gives it a more natural look. 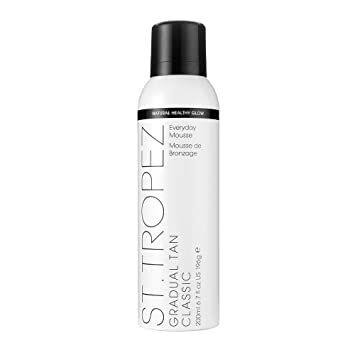 I also use some of the St. Tropez products while I'm on vacation or just too lazy to go get a full spray. The face lotion I try to use every day in order to keep my face tan (especially since I wash my face twice a day). I also use the dark mousse to touch up my legs mainly- if I have to shave- or if I have an event and I don't have time to spray. It works really well and it dries super fast and surprisingly doesn't streak at all! They also make an in shower gel that I use on my legs a couple times a week just because my legs are the hardest part of my body to tan.